Private lessons in all instruments and in languages, including Italian, French, Russian, Spanish, Chinese, Japanese and ESL. 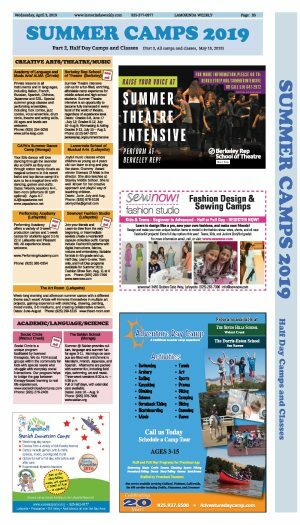 Special summer group classes and performing ensembles, including rock combo, jazz combo, vocal ensemble, drum circle, theatre and acting skills. All ages and levels are welcome. Join us for a fun-filled, enriching, affordable camp experience for middle school and high school students. Summer Theatre Intensive is an opportunity to become fully immersed in every facet of the world of theatre, regardless of experience level. Dates: Grades 6-8, June 17 –July 12; Grades 9-12, July 16–Aug 9; Filmmaking & Acting Grades 9-12, July 15 – Aug 2. Your little dancer will love dancing through the lavender sky at CAPA as they soar through cotton candy clouds as magical unicorns in this sweet ballet and tap dance camp! It’s sure to be a magical time with dancing, games and crafts. Dates: Weekly sessions M-F, 9am-noon (aftercare till 1pm optional). Ages 4-7. Joyful music classes where children as young as 4 years old can learn to sing and play the piano. Grammy Award winner Xiomara Di Maio is the director. She also teaches at Stanley Middle School. She is well known for her creative approach and playful way of teaching children. offers a variety of 3-week production camps and 1-week camps for students aged 3.5 to 22 in Lafayette and Pleasant Hill. All experience levels welcome. Week-long morning and afternoon summer camps with a different theme each week! Artists will immerse themselves in multiple art projects, gaining experience with sketching, drawing, painting, mixed media, 3-D mediums, and creating collaborative artwork. Social Circle is a unique program facilitated by licensed therapists. We do FUN social groups within the community for kids with special needs who struggle with everyday social interactions. Our program helps to bridge the gap between therapy-based learning to real life experiences. Summer @ Saklan provides culture, language and summer fun for ages 3-11. Mornings on campus are filled with enrichment in Mandarin, French, Japanese, and Spanish. Afternoons are packed with summer fun, including field trips, swimming, art and music. Three-week sessions 8:30 a.m. – 4:30 p.m.
Full or half days, with extended care available. Learn or improve Spanish language skills through games, music, arts and crafts, science projects and cooking. During each weeklong camp students learn vocabulary related to a specific kid-friendly theme such as Wondrous Outdoors at the Reservoir or Secret Agent Camp. Full day, 9 a.m.- 3 p.m. Before/after-care available. Half-day options also available. session. Groups of no more than 10 students and will meet four times over the summer - led by Mr. Lorie, a JM math teacher. essay-based expository writing, developing strong writing skills in the process. Dates: June 10- June 28 and July 8- Aug. 2. 12th graders. No experience necessary. Dates: One-week sessions starting June 10. Cal Magic June Soccer Summer Camps are a joy-filled soccer experience for boys and girls ages 6-12. Our coaching staff ensures young athletes gain the sports knowledge and technical skills required for their next step in soccer while also learning life skills such as leadership, respect and hard work. Incoming 4th - 8th Grade 2-4 p.m.
LMYA Swim Team’s Gutter Guppy Program focuses on teaching stroke technique to our youngest swimmers, preparing them for the swim team experience in a fun, low-key environment. Evaluations held June 4th & 7th, 5:30pm at Acalanes High School. Register by June 10. Registration is now open for our 2019 Summer Swim Team, Spring Stroke Clinics, and Junior Gator Learn-to-Swim program. No club membership is required in order to participate. The summer team practices in the afternoons at Miramonte High School. camps provide excellent training for learning rowers in rowing technique, teamwork, physical fitness and endurance. Within a week, rowers will gain enough skill to row their first race! The Randy Bennett Day Camps held at Saint Mary’s College in McKeon Pavilion are a great way for boys and girls ages 4-13 to receive top-class instruction on every aspect of the game, led by Coach Bennett and his staff. Morning, afternoon and full day options available. Sherman Swim School is a family business which has taught swimming to over 39,000 students and has produced numerous diving champions since 1961. The combination of one-on-one instruction with patient, encouraging teachers, and extremely comfortable water (90-92 degrees), creates an ideal learning environment. Sessions are 3-4 weeks long. 1, 2, or 3 days per week. going on safari and seeing big game freely roaming the Serengeti? Hop in our Serengeti Safari jeeps to caravan from skits and music to crafts, snacks and rec and learn how God’s love takes care of the animals and covers us, too! 9 am-noon. Must be 4 (by June 1) through entering 5th grade. Gear up for an adventure! At Vacation Bible Camp this year, we will explore God’s goodness and celebrate a ferocious faith that powers kids through this life through songs, stories, games, experiments, and more. For 4-year-olds through completed fourth graders. VBS Summer Camp, July 15-19 for grades 1-5.
robotics, basketball, carpentry, flag football, gymnastics, chess and more! Registration Begins April 8th. Dates: various dates and times available. 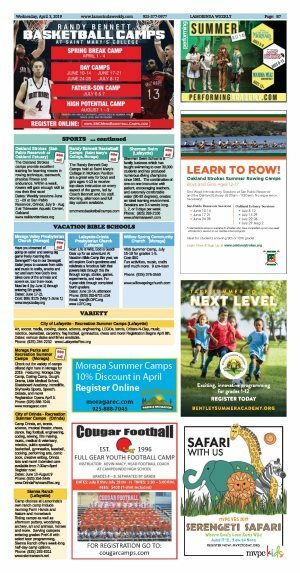 Skateboard Academy, Incrediflix, Skyhawks Sports, Speech, Debate, and more! 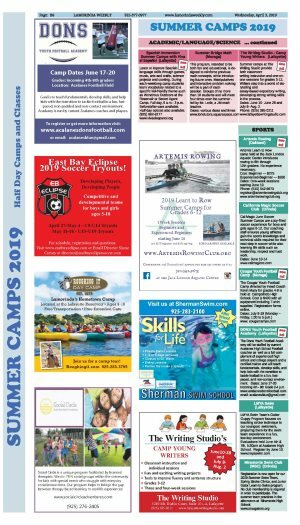 Camp Orinda, art, tennis, science, musical theater, chess, dance, flag football, engineering, coding, sewing, film making, music, medical & veterinary, robotics, public speaking, basketball, gymnastics, baseball, cooking, performing arts, comic book, creative writing, Orinda kids and more! Extended care available from 7:30am-6pm! Register now!